First of all... I'm in Azerbaijan! So far it's good. The office is pleasant and filled almost entirely with former colleagues from the Sochi and London games. The work is not crazy (yet). And Baku turns out to be a lovely city. Or at least the westernised, sanitised, 5-star hotel version that I'm currently cosseted in is lovely. I've even found an apartment just a few minutes walk from the old walled city, and hope to move in next week some time. I'll certainly write more about Baku and Azerbaijan in the weeks to come, but for now there's one last London thing you should hear about. Despite the fact that it was all a bit much in the last few weeks - finishing lingering bits of London work, packing up everything in Brixton, dealing with the boat - I did manage to find time on my last day in London to do something entirely unrelated to work or packing or boats. There’s been a remarkable and moving art installation going on at the Tower of London this summer and I was determined not to let slip my last chance to see it. 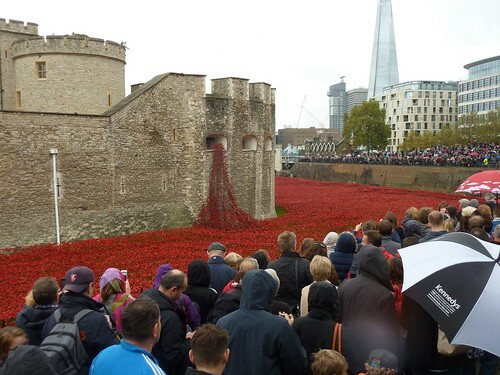 Because 2014 is the 100th anniversary of the start of the First World War there have been a lot of different remembrance events throughout the year, but "Blood Swept Lands and Seas of Red” must surely be the most arresting. The installation consists of thousands upon thousands of handmade ceramic poppies planted in waves in the moat of the Tower of London. Each of the 888,246 poppies represents a British or Commonwealth soldier killed in World War One, and they spill across the lawn and cascade over parapets in a stunning display. As the project’s own website says: "The scale of the installation intends to reflect the magnitude of such an important centenary creating a powerful visual commemoration." A panoramic shot of the northwest corner of the Tower. Powerful indeed. 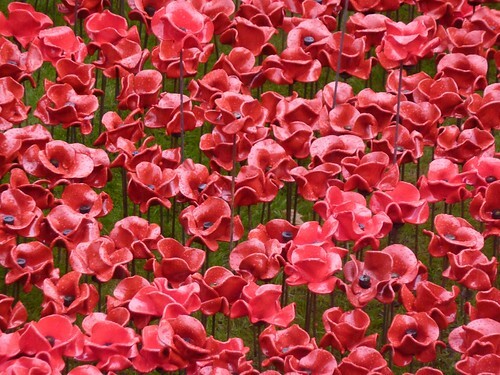 The poppies are the work of ceramic artist Paul Cummins and theatre designer Tom Piper. Cummins crafted the poppies themselves, which consist of two layers of thin clay cut-outs joined together and then individually shaped by hand by a team of artists and ceramic workers in Cummins’ workshop in Derby, using many techniques from the First World War era. Tom Piper designed the layout of the poppies in the moat - where they’re placed, how they flow around the moat and how they interact with the Tower itself. The title of the work comes from a Derbyshire man who joined up early in the war and died in Flanders. Knowing that everyone was dead and he was surrounded by blood, the man wrote in his will: "The Blood Swept lands and seas of red, where angels fear to tread." They’re beautiful - each about the size of your hand, and each one unique. Here’s a video about how the poppies were made. As you can imagine, the installation of such a - literally - monumental artwork is a massive undertaking. The job started in July when a senior Yeoman Warder of the Tower, Crawford Butler, knelt and planted the first poppy in the grass. 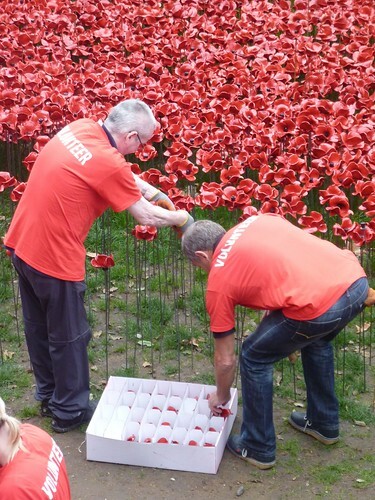 Since that time, teams of volunteers have been working to assemble and plant the hundreds of thousands of poppies that now fill the moat, with the aim to finish the work on Remembrance Day, November 11. After that time the poppies will be removed and mailed out to the thousands of people who’ve paid £25 each to purchase one. Proceeds from the sale of the poppies will be split among six different charities that support servicemen and women, including Help for Heroes and the Royal British Legion. 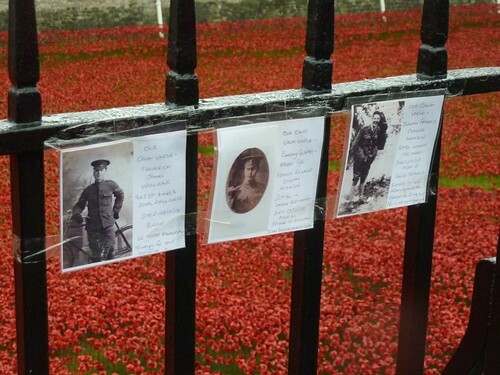 Unsurprisingly, despite the huge number available, the poppies sold out. I missed the chance to buy one, but am gratified that none will go homeless. The project has definitely captured the public’s interest. 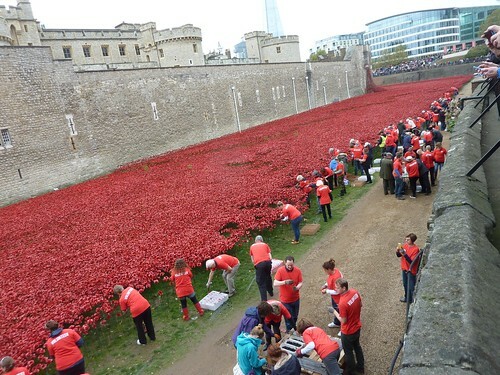 Besides all those who pre-paid to buy a poppy, hundreds of people volunteered to plant poppies in the moat. Such is the popularity of the project that so many people volunteered that, despite the scale of the undertaking, they actually ran out of places. The whole thing reminded me very much of working on a ceremony - the mind-bending scale of the thing, the teams of volunteers, and the stunning effect of the combined efforts of so many people. My brain could’t help but start whirring about the planning and logistics that must have gone into the project. And while a few years ago I would have been stumped about how one would even start to tackle such a thing, now I can picture how it must all have been achieved, which was a gratifying realisation given that I’m about to embark on another one of those massive ventures myself. Here’s the team of volunteers that was working on the Sunday morning I went. Each poppy is supported on a metal spike that’s hammered into the grass before the actual ceramic piece is fitted on top. Late in the week when I visited, there was a news report suggesting that people who wanted to visit the Tower to view the poppies should delay until after the weekend. Crowds had been especially heavy that week because of the half-term school break, and the weekend was expected to be particularly rammed. I had no option but to visit on that Sunday - my last day in London - so I decided to go early in the day to try and beat the worst of the crowds. Of course this turned out to be complete folly. Every sidewalk was filled with people by the time I arrived, though in fairness it was already about 10am by the time I got there, even though I’d skipped breakfast and headed out as soon as I woke up. I wonder how soon those crowds start to assemble in the mornings? Dawn, probably. Apparently the display is quite dramatic at night as well, when the waves of poppies are floodlit against the Tower. You can also really see the crowds in the panorama shot above. Just this week there have been calls for the poppies to remain at the Tower past the original Remembrance Day closing date. At first the organisers at Historic Royal Palaces demurred, saying that the operation to remove, pack and mail the poppies was to massive to be delayed. But the clamour from the public and political leaders, including the Prime Minister and representatives from all four political parties, was such that just a few days ago it was announced that two sections of poppies would remain in the moat until the end of November. At the end of the month they'll then tour towns and cities in the UK before being installed permanently at the Imperial War Museum in London and Manchester. Which is, frankly, just excellent. (Though if the poppies are sold out what happens to the people who bought flowers that will now be stuck in the museum forever? Online sources are suspiciously silent on this subject.) And in another heartwarming twist, the Chancellor has waived VAT on the sale of poppies. Even better, the costs of touring and permanently installing the smaller displays of poppies will be partially offset by fines assessed against banks involved in the LIBOR scandal. Ha! During my visit I saw lots of families with children, and even a few old men in uniform, some in wheelchairs being pushed by helpers, which was gratifying. And despite the fact that it started raining when I was about half way around the Tower, there was very little grumbling to be heard. Most people were polite and though there was hardly room to move, the crowds shifted and flowed in a way that meant if you were a bit patient, spots would open up along the railings surrounding the moat and you could slip in for a few photos almost anywhere. Still, the sheer number of people meant that the sort of quiet reflection one might be inclined to when faced with an installation of this sort really wasn’t possible. However, there were a few moments when the personal tragedies were brought home. Like this family memorial taped to the railings near the main entrance. Because I was alone, unburdened by small children, elderly relatives, prams, dogs, or other encumbrances, I managed to move around fairly well. And though it was busy, there were moments when you couldn’t help but be struck by the tragedy of the thing, contemplating the number of lives lost simply because it was so graphically displayed before you. But by the time I’d circumnavigated the site the rain had picked up considerably and I was very very ready for a dry spot and a hearty breakfast. I made my way back across Tower Bridge and squelched along to the tube, discovering along the way that my shoes were no longer nearly as water-resistant as they once were, and making me reconsider my shoe-packing options for later that evening. One full English breakfast later, I was fortified enough to tackle the last of the packing and get things sorted out for the early flight the next day. And now I’m in Baku, Azerbaijan, which is such a complete departure from my life of the last few months that it’s a bit like decompressing too quickly and getting the bends (Or so I imagine, never having had the bends, but nonetheless being fond of a good metaphor.) I’ll write about life in Azerbaijan as I’m able, but for now know that I’m fine, settling in, dusting off my Russian and making tentative stabs at Azeri (whose alphabet includes such charming characters as this: Ə). Stay tuned. Thanks for this post. I have been fascinated by this exhibit and so wishing I could see it. Your description and photos were great. amazing Pam - thanks for sharing it - and excited to read about Baku! Thanks for giving us a look at this memorial through your eyes. As you say, the scale of human loss is staggering. Good luck in Baku!